Welcome to TriangleRiders. We hope you'll enjoy the site. Here you will learn about several folks who came together back in 2000 to form a motorcycle group called 'TriangleRiders'. This is kind of a misnomer, since we have riders join us from all over the state! We are a diverse group of riders in all aspects of the word! Our bikes range from Harley cruisers to Japanese sportsbikes. If you are on two wheels, you're facing the same situations as the rest of us. So leave any attitude elsewhere, bring an open mind and come join the ride! Our riders are of various abilities and comfort levels. 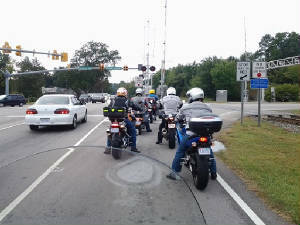 All bikes are welcome and great friendships are made! Our main objective is to find other riders who share our passion for the open road and the freedom of a bike. If you are interested in riding with us, please click on 'Contact Me' to the left and drop us a line. We would love to hear from you. This site is still under construction so expect more information in the very near future. If you have any questions or comments, please contact Stephen.